In honor of Mental Health Awareness Month, Vocational Rehabilitation shares a story about how proper training can help a person excel at their job. He was always very polite,” April says. “He makes up for any limitations he has with effort. Emil Rodriguez has always had a fascination with things that move. That’s why he had his sights set on a career in the automotive or aircraft industry. Emil had depression with learning disabilities, so he knew securing a job might be difficult – but he wasn’t going to give up on his dream. A school counselor suggested Vocational Rehabilitation (VR), a federal-state agency that helps people with disabilities get or keep a job, and he jumped at the opportunity. Emil’s original goal was to work at an automotive company, and VR paid for his training at Atlantic Technical College. Unfortunately, he had trouble with the certification exam, so he decided to give another industry a try. 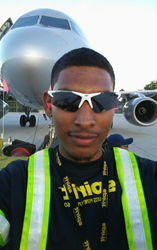 Switching gears, Emil accepted a job as a ramp service agent at Spirit Airlines. Even though Emil had found the perfect job, there were a few roadblocks along the way. During his first week of work, he had transportation issues. VR technician Carl Gregory worked tirelessly to ensure that Emil would have a way to get to his new employer. “It was a serious situation because we wanted to be sure he didn’t lose the job because of an issue with transportation,” April says. Emil’s new job brings with it some pretty cool perks as well. “When he hit the 90-day mark, he was given free flights as a benefit,” she says. “And now he’s celebrated his one year anniversary, has traveled across the country, and was able to save up and buy a new car.” No more transportation issues for Emil. Emil enjoyed working with April and is grateful for the opportunities she was able to prepare him for. “Working with April was really good. She is kind and helpful. She was also very knowledgeable and had a lot of answers to questions,” he says.